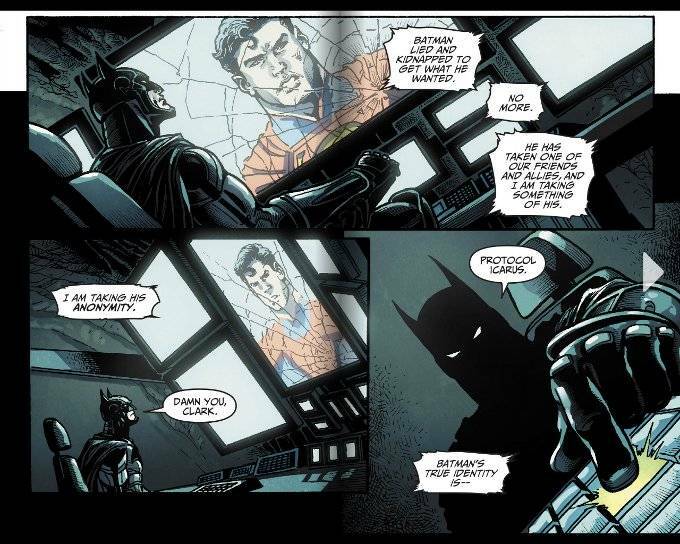 Irony abounds in Injustice: Gods Among Us. Consider how this comic is based on a video game made by the people responsible for Mortal Kombat – a game series better known for excessive violence than complex characterization. Yet writer Tom Taylor has offered some truly deep character analysis over the course of this series. There is also irony in the fact that Taylor’s take on the characters involved seems more like the classic, pre-New 52 versions of many of DC Comics most popular characters despite the series being set in the dystopian future of an alternate DC Universe. There is a further irony in how well Taylor balances the horror of this setting with several moments of genuine humor. 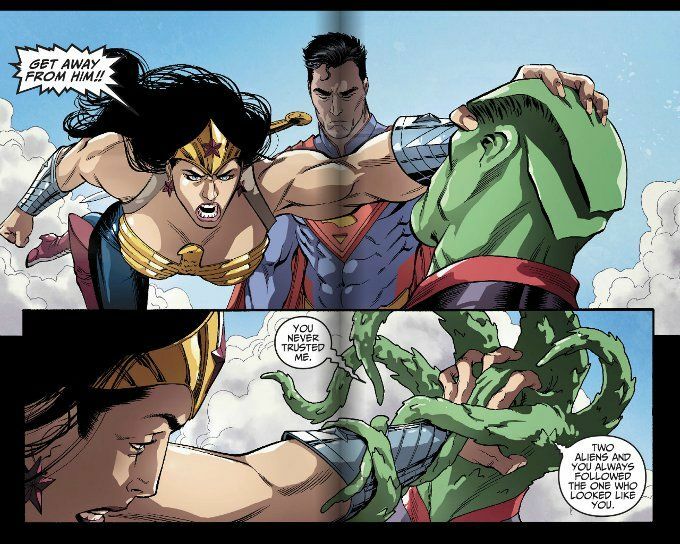 Consider how Superman and his Regime are able to find a way to expose Batman's secret identity to the world after Batman disables all the broadcast media in the world through the power of social media in Injustice #28 and contrast that with the terrifying battle between Superman, Wonder Woman and Martian Manhunter in Injustice #29. Given a setting in which all the rules can be broken and where many of the characters are acting contrary to their nature, Taylor paradoxically allows us to analyze the core of what each character should be. A good example of this analysis can be found in Injustice #30 - a comic I'll gladly place besides Joe Kelly's What's So Funny About Truth, Justice And The American Way? and Grant Morrison's All Star Superman as one of the greatest Superman stories of all time. The story is told through the eyes of an ordinary teenager in Metropolis as he recalls the hero Superman used to be and the man he became later. 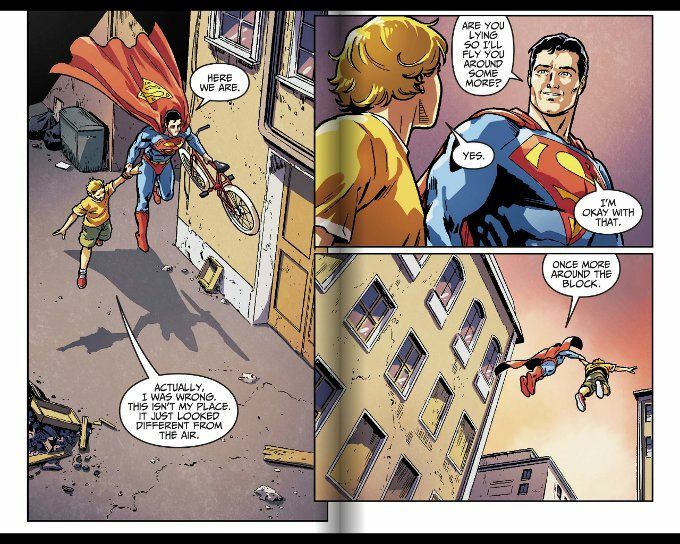 I don't know if Taylor wrote this as a response to the recent Man of Steel movie but I definitely agree with the sentiment of preferring the Superman who will stop to help a boy with his broken bike over the man we see in the comics of Scott Lobdell. The artwork is as excellent as the writing. Tom Derenick, Mike S. Miller and Bruno Redondo have completely different styles but each delivers epic-worthy artwork in their own way. In a better world of tomorrow, perhaps we'll see them working on other books with Tom Taylor? My preferences would be Justice League, some manner of Superman title and a classic Green Arrow book.